Outside the Alexanders' home, Vance Astrovik, Robbie Baldwin and Sam Alexander accidentally drive over the mailbox. Vance mentions they should have known that Sam didn't know how to drive. Robbie believes he smells the truck's emergency brake is burning. Sam also smells something and realizes his family's house is on fire! Running inside, Vance and Robbie put out the grease fire in the kitchen while Sam looks for his family. He runs into the living room to find his mom and sister being held hostage by Kaldera! Kaldera threatens to incinerate Eva and Kaelynn if unless Sam listens to her offer of Barak-Tar. The Alexanders' attacker wants to fight Sam Alexander without his Nova Force powers. In return, she will not use her Kroovs weapon. Sam reluctantly agrees and hands his Nova helmet to Speedball. Later on the outskirts of Carefree, Kaldera tells Sam that his mother's bonds are no longer armed. The young hero tells her to get the fight started. Kaldera responds by repeatedly hitting and kicking Sam! She asks him if he is not a trained in combat. Sam Alexander informs her that he doesn't like fighting bullies. His attacker tries to convince him that she's not a bully but Sam doesn't see it that way. He clarifies his position by saying that he doesn't like fighting fair with a bully. Vance and Robbie respond to Sam's cue and send his helmet to him. Kaldera now finds herself facing a very angry Nova and is blasted through a vacant building by a Nova blast! The teenager frees his mother and she tells him to finish Kaldera off. Sam smiles and flies towards his foe. Kaldera activates her portable teleporter and the two are sent to the Slaughtership in lunar orbit. While Kaldera is stunned by Nova impact, Sam looks around the ship and is surprised to find a Nova helmet on the floor! The alien psychopath tells Nova that the Black Nova who wore that helmet was a Garlon from the planet Centrifix IV. She also informs him that she ripped out both his hearts with her bare hands. Suddenly the Garlon's helmet interacts with Sam's and tells him that the transfer is complete. Before he can figure out what the helmet meant, Kaldera swings an axe at Sam. He is able to dodge the attack and punches her through a wall. Stunned, she accuses Nova of cheating by breaking the conditions of Barak-Tar. Sam Alexander responds that Kaldera called his mother a cow and knocks her unconscious through the floor. When the victorious hero looks up, he finds himself facing numerous aliens. 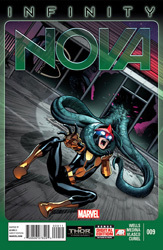 However, instead of attacking Nova, they teleport him back to Earth. At the Alexanders' home, Sam's family and fellow heroes are excited to see Nova arrive safely. As Sam begins to introduce Robbie and Vance, his mother tells him that she has already been introduced and would like to hear more about the new team they are forming. Back on Slaughtership, Kaldera is awakened to find herself strapped inside a device. Proxima Midnight has been ordered by Thanos to condemn her to the Midnight Sphere. In the sphere, Kaldera will be forced to experience all the amassed degradation and pain of all who have fallen before them. Proxima Midnight reminds her to remember why she is being tortured. Kaldera promises she will not forget.